Guess who is the second-most powerful nation in the world? No, it’s not China. Nor Russia. Nor Germany. Nor Japan. It’s us! The United Kingdom! That’s according to the Audit of Geopolitical Capability published January 4 by the Henry Jackson Society. Based on over 1,000 data points, the study’s authors conclude that it shows “a stinging rebuke to ‘Britain’s army of doom-and-gloom mongers,’” according to the press release. It would be easy to quibble with the figures. But the study is right about one thing. On paper at least, the United Kingdom is still quite a powerful nation. So why is it making such a pig’s ear of Brexit? The UK is supposed to leave the European Union on March 29, but even that is uncertain. Just today, Parliament passed legislation designed to push the government to remain in the EU if Parliament does not approve a deal. Meanwhile, Parliament seems set to defeat Prime Minister Theresa May’s Brexit deal when (or if) it is voted on next week. It seems almost impossible to get any deal through Parliament—yet Parliament won’t approve a no-deal either. Britain managed to create one of the largest empires the world has ever seen. Yet it now seems incapable of leaving a jumped-up trade bloc. What did Britain have in 1800, as it really began to rise to greatness, that it lacks today? The figures don’t give you much of a clue. France and the Habsburg Empire had larger populations. Just about every empire in Europe had a bigger army at the time. Britain didn’t even lead in industrial production. In 1800, Britain’s share of the world’s manufacturing output had just edged ahead of France’s, but was behind Russia’s and well behind China’s. If you know where to look, there are indications, even in 1800, that Britain was about to burst into greatness. But based on the 1800 numbers, few would have labeled Britain the world’s No. 1 or even No. 2 power. So what did Britain have then that it doesn’t have now? Our free book The United States and Britain in Prophecy relates how God promised to bless Britain and America—and that those blessings would begin in 1800. Those blessings didn’t come because of the righteousness of our nations. God promised Abraham, unconditionally, that his descendants would become mighty nations (Genesis 22:16-18). The British are among those descendants. With this in mind, the reason Britain struggles with Brexit becomes clear. It’s not because voting “leave” was a mistake. It’s not that the nation is racist. It’s because God isn’t blessing the nation anymore. In fact, He is punishing the nation because, even with all those blessings, we have refused and continue to refuse to obey Him. Britain’s struggles today match exactly how God said He would curse the sinning descendants of ancient Israel. God gave Britain a vast amount of material blessings, and many of those blessings have been removed. But there is still a lot that remains. Enough for the Henry Jackson Society to rank us No. 2 in the world. God promises to remove even these blessings too—but first, He has cursed the crucial intangible elements that constitute a nation’s power. In Isaiah 3, He says that He has taken away our great leaders—at all levels: great statesmen, captains of industry, eloquent orators who can galvanize a nation in a time of crisis. In Hosea 7:11, God forecast that Britain, the descendant of the Israelite tribe of Ephraim, would suffer from a foolish “silly dove” foreign policy. In Leviticus 26:19, God says He will “break the pride of your power”—there is still power there. Even as far as Britain has fallen since the height of its empire, it still has some power. But it has no will, no national sense of purpose to use it. It is hard to measure these crucial elements of national power—even if you do use more than 1,000 data points. But these are the ones He took away first. Britain is left like a moth-eaten garment (Hosea 5:12). Take a quick glance, perhaps looking only at quantitative data, and things look great. But put that garment to the test, by merely taking it off the hanger, and it all falls apart. The Bible is your perfect guide to Brexit. Its forecasts make sense of the bewildering array of blunders coming out of London. 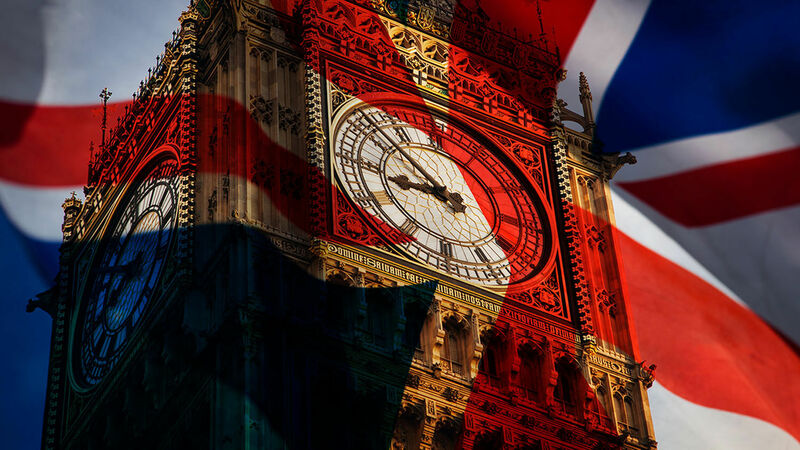 The United States and Britain in Prophecy, by Herbert W. Armstrong, will explain to you what the Bible says about modern Britain. It will give you the “all-important master key” to understand world events. But more importantly, it will prove that the Bible is a now book. Its prophecies explain the news you see around you. Chaotic and confusing as world events are, God does have a plan for this world and for all nations in it. He is in control. The United States and Britain in Prophecy proves that God has a plan, and it gives the hope behind all the bad news we see in the headlines—the reasons for the curses hitting our nations today. To learn more about this active, living God and His plan for the world, all nations, and you, read The United States and Britain in Prophecy. As with all our material, it is completely free, including shipping, with no hidden catches or small print. We’re not trying to get something from you. We’re just so excited about the message it contains that we want to get it out to the largest audience possible.